Mechatronics is a design process that combines mechanical, electrical, control and computer engineering. An important development from this technology is intelligent actuators. 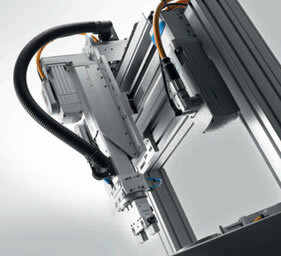 These actuators are capable of complex motions and force control. We offer one of the most comprehensive selection of smart actuators in the world. One unique advantage we have is the ability to combine several different technologies – electromechanical, servo-pneumatic and pneumatic – to give you the highest performing, most cost effective solution to your motion control requirements. To meet your precise requirement, as well as budget, we offer a wide range of technologies. The following is a description of each technology. To optimize your design we offer many different actuator styles and construction technologies. These various actuators can be combined to make multi-axis systems. Defined load, dynamic response and positioning characteristics. Wide range of sizes and work envelopes. Add electric grippers or suction cups. Maximum acceleration and high effective load. High pick rates and maximum working strokes. Optimum working space coverage, compact mounting. To complete your system we have the precise controller for your application. All actuators can be controlled via a simple PLC with digital I/O. The move can be either a simple profile move or a series of complex moves. 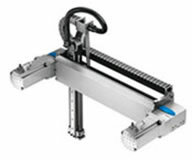 Other actuators can be controlled with powerful, simple to use multi-axis controllers. For high level control systems we offer integrated Fieldbus network solutions with the most popular protocols such as Ethernet IP and Profibus.